6 (six) Loose Ultralife Lithium 9V Batteries. Energizer MAX. 1 9v battery per order. 25% lighter than standard alkaline. 2PK - Sunbeam Super Heavy Duty 9V Batteries - Mercury Free Condition is New. Shipped with USPS First Class Package. Energizer Ultimate Lithium 9V 9 Volt Battery 1 Count. Exp: 12-2028 #L522BP. HIGH-QUALITY BATTERIES. Tested by independent labs, the Fuji EnviroMAX battery boasts one of the longest shelf lives in the industry. 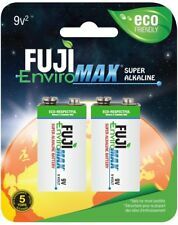 Boastingmaximum power with minimum impact ,Fuji EnviroMAX Super Alkaline Batteries provide thebest of both worlds at no added cost. Trending at $12.74eBay determines this price through a machine learned model of the product's sale prices within the last 90 days. Duracell® Coppertop 9-Volt Alkaline Batteries, Pack Of 4. FREE SHIPPING. Duracell® Coppertop 9-Volt Alkaline Batteries, Pack Of 4. Condition is New. Shipped with USPS First Class Package. FREE SHIPPING. The batteries are expired on December 2020 or later. 2 pack. Energizer Advanced Lithium LA522 9V battery. NEW! This listing is for a 2 pack 9V batteries. Batteries are brand new. year of expiration varies. The Energizer Ultimate 9V Lithium Primary Battery is one of the best Lithium batteries you could buy for your electronic device. The 9V features a 10-year shelf life that will keep your battery working for years inside or out of an electronic device. Trending at $12.98eBay determines this price through a machine learned model of the product's sale prices within the last 90 days. The 9v operates many small devices. With Duralock Technology, you be assured you are getting quality product. Because we know what matters to you, and we bring it right to your door. No fuss, no hassles! It has an amazing 5 Year Shelf Life due to its Hi-Density Core and Duralock Power Preserve technology. The PowerCheck energy detection system is convenient and allows users to know exactly how much power their battery has left. • 200 Heavy Duty 9 volt GP Batteries for sale. Expire dates of 10/2016. From the makers of the #1 longest lasting AA battery (Energizer Ultimate Lithium) and the Energizer Bunny. Model: 6LR61. Chemistry: Alkaline MO2. Jacket: Aluminium Foil battery. Shelf Life: 10 year s(no t printed on battery ). Height: 48.5mm. Battery Super Alkaline GP 9V - 10 PCS. GP Batteries Super Alkaline 9V batteries. GP Super Alkaline is especially designed for the most popular portable electronic devices. These are Duracell Batteries. We are here to help you. Worlds #1 most advanced Alkaline Battery based on Hi-Density Core and PowerCheck. Duracell Quantum 9V Alkaline Batteries with Duralock. Energizer Industrial 9v Alkaline Battery EN22. Model # EN22. The Energizer Industrial 9 Volt battery is a strong, long-lasting alkaline battery. Alkaline 9v. Each Energizer 9 volt battery has a minimum 3 year shelf life and is date coded with the expiration month and year stamped on each battery. :Duracell CopperTop All-Purpose 9-Volt Alkaline batteries are not only dependable, theyre also long-lasting. About Vitacity. Duracell 9V battery 8 Pack Brand New Sealed Best Before 2019. Condition is New. Shipped with USPS Priority Mail Padded Flat Rate Envelope. • 400 Heavy Duty 9 volt GP Batteries for sale. Expire dates of 10/2016. These batteries can be used in place of regular alkaline 9V. May be used for smoke detectors. High energy density. 9V, PP3, LR22, MN1604, BLOC, E-BLOC, 6LR61, 1604AU, X22, 1604, 1604A, 1604AC, 4022, 522, 6AM6, 6F22, 9VOLT, A1604, CLR6, K9V, KA9, ND65V, R22, RB100893. Ultra Super 9V batteries . Type Zinc Carbon. Quantity 2 batteries. Sunbeam Super Heavy-Duty "9V" Batteries, 2-ct. Always keep a spare pair of 9-volts around the house! UPC: 629312145065. DURACELL DURALOCK POWER PERSERVE DL2032 BATTERIES THIS LISTING IS FOR ONE DL2032 BRAND NEW IN BOX EXPIRATION DATE 3 YEARS OR GREATER! 8 x Panasonic 9 Volt (9V) Super Heavy Duty Power Zinc Carbon Batteries. Chemical Composition = Carbon Zinc. High Quality - Long Life Battery. 8 x 9-Volt Batteries. Battery remains fresh on the shelf up to year 2022 or later. Designed specifically for use in demanding industrial applications, Energizer Industrial batteries have a 5-year shelf storage life. Common uses are in devices such as alarm clocks, smoke detectors, and radios. New long lasting 9 volt alkaline battery, buy 3 and receive 1 free battery! New long lasting 9 volt alkaline battery, quick shipping as soon as verified payment! Buy 3 and you will receive 1 free battery! Trending at $16.83eBay determines this price through a machine learned model of the product's sale prices within the last 90 days.